Roy is the main character of the Fire Emblem: The Binding Blade game. In The Binding Blade, Roy led the troops of Pherae into battle in his ailing father’s stead, and now he brings his speed and talent for short-range combat into Super Smash Bros. for Wii U & Nintendo 3DS. His sword, the Sword of Seals, is uniquely powerful at the base of the blade. 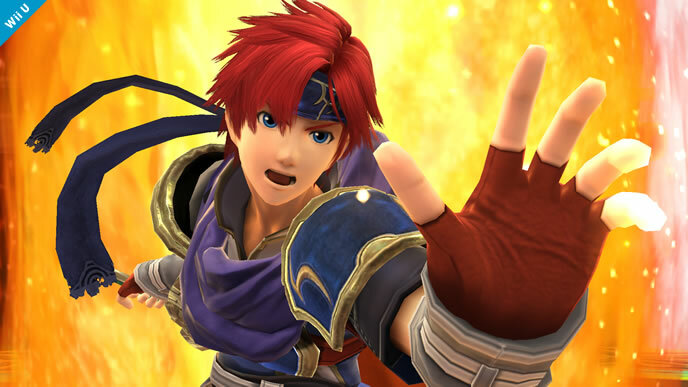 Roy has a unique moveset that can overwhelm his opponents: his counter move and smash attacks are among his best options. Roy’s Counter is special compared to his other Fire Emblem counterparts in that it has a higher damage multiplier, and his amiibo AI is adept at using it with proper timing. Roy also has a reverse tipper mechanic on all of his attacks – the closer he is to his opponent, the more damage he inflicts. This is best described as a double-edged sword – Roy can punish aggressive enemies but has to get up close and personal to reach his maximum power. 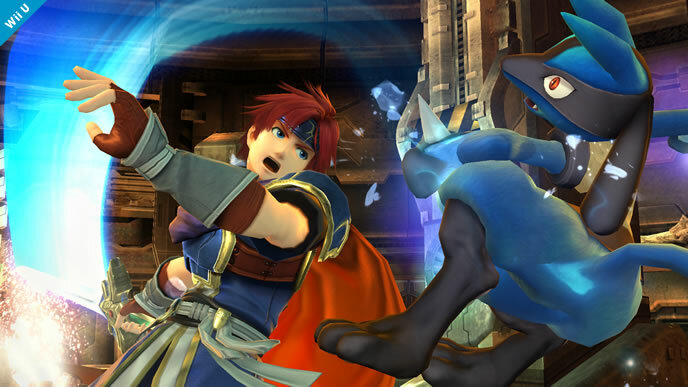 Roy has a great set of smash attacks as well, with his forward and down smashes having the potential to break shields. Roy certainly has his strength, but he comes with an equal amount of flaws. His recovery is poor, and although it can be aimed, it doesn’t cover much distance. His AI also suffers from several issues: Roy’s amiibo has a hard time learning to use his full side special. He occasionally whiffs his neutral special and likes to use his up special at random. These tendencies leave him vulnerable to incoming attacks. Overall, Roy is an above average amiibo with a powerful arsenal to conquer opponents. It will take some time to iron out his flaws, but with patience and determination, Roy can be a force to be reckoned with. Neutral options: forward tilt, down tilt, up tilt, and Double-Edge Dance. Roy’s tilts are all fast and powerful – when using them, get as close to your amiibo as possible to maximize their damage output. When using Double-Edge Dance, be sure to land all four hits of the attack. Main KO moves: forward smash, up smash, and Counter. 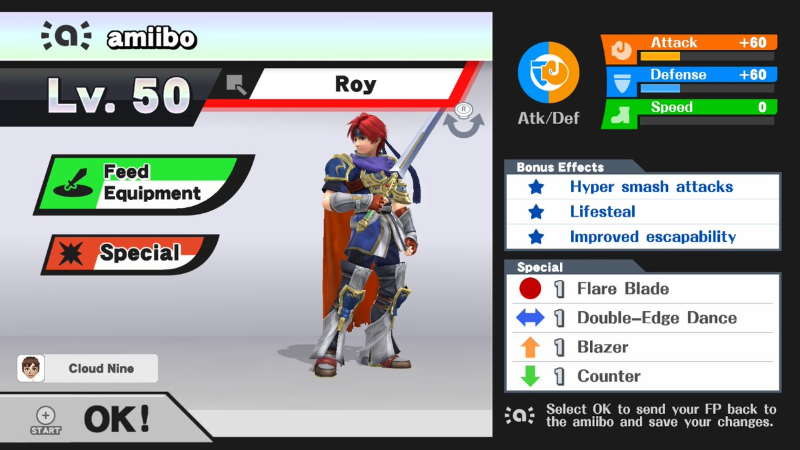 At point blank, Roy’s forward smash is his strongest move (bar Flare Blade). It can be used as a KO move, a shield breaker, and an edgeguard. 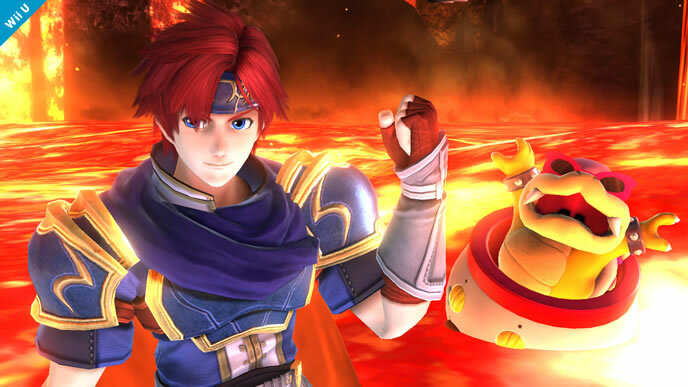 Roy’s up smash is great for aerial punishes due to its multiple-hit properties. Roy’s counter move is one of the most damaging in the game. It’s best used against smash attacks and to punish aerials. Moves to avoid: Flare Blade and Blazer. Roy’s amiibo may use these two moves at random. They don’t bring him any notable benefit, and leave him horribly vulnerable afterwards. It’s best that you refrain from using these two attacks during training. Thanks to Supernova for compiling Roy’s information. Images are courtesy of SmashWiki and the official Super Smash Bros. website.